Grand Central Publishing, 9781538763094, 256pp. 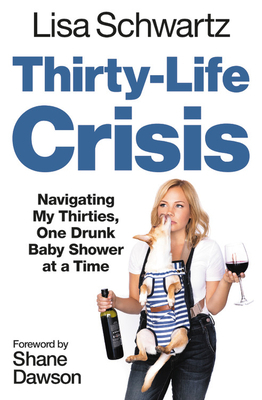 THIRTYLIFE CRISIS Lisa Schwartz's stories and musings are all about watching her friends adult like pros, while she tries to understand why she doesn't want or can't seem to find all the things they have for herself. Like a big sister who's already seen it all, Lisa will take readers through her own life experiences to say that one thing we all need to hear: you are so not alone. Unabashed and unfiltered, Schwartz's voice and candor will appeal to anyone in their thirties who just can't deal with the never-ending Facebook feed of friends' engagement photos and baby pictures, the trials of figuring out where their passion meets their career, and everything in between. This book is your new best friend. Best known for her successful and irreverent YouTube channel, Lisbug, which features original comedic and musical content, Lisa Schwartz has garnered more than 2 million unique subscribers and over 395 million views. Her most popular video, a parody of Taylor Swift's "Shake It Off," generated 19 million views and received coverage in several outlets, including The Huffington Post. Lisa also starred opposite frequent collaborator Shane Dawson in the feature length comedy "Not Cool," which immediately shot to #1 on iTunes and Netflix. Most recently she created and starred in the Freeform original series Party Girl, which premiered at Tribeca in April and can be seen on Hulu. The show is currently being developed for network TV. She also created the comedy series in which she starred, This Isn't Working, which premiered to tremendous success on ABC Go and Hulu. As a comedic host, Lisa has made many online segments for Seventeen and Yahoo and is currently hosting the after show for ABC's The Bachelor franchise.